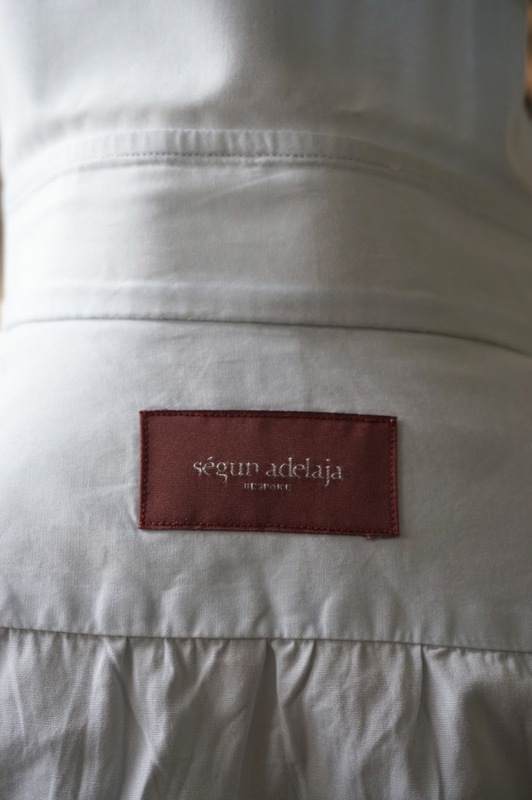 The third in this series on bespoke shirts, this post looks at the made-to-measure service offered by Segun Adelaja, who owns a boutique in the Prince’s Arcade. It is obviously not a direct comparison to either Burgos or Satriano Cinque, as it is not bespoke and not cut by hand. However, as the price is £240 for a shirt, it is actually more expensive, reflecting the costs of having a shop in London and the cost savings of not having to travel abroad. 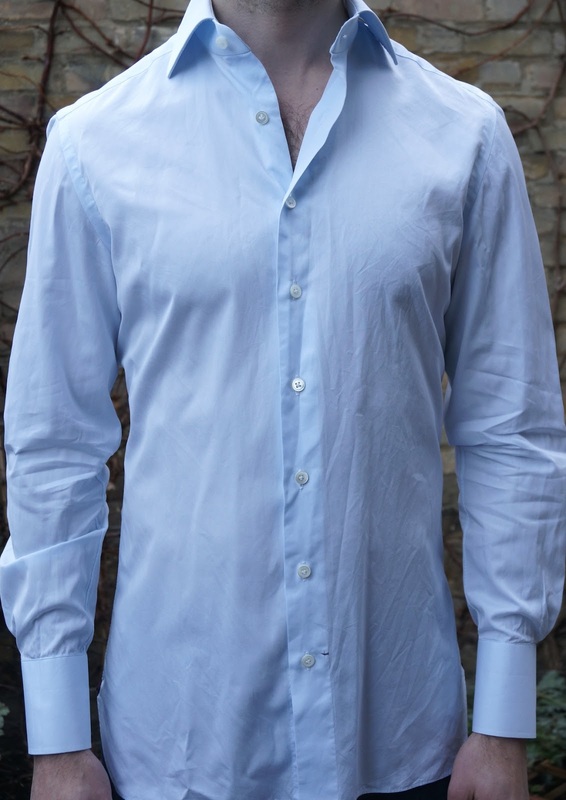 It is also representative of the kind of service offered MTM by many tailors and shops in London and New York, and therefore an everyday alternative for many making the decision over where to have their shirts made. As with most Italian MTM operations, there is a big range of choices in collar and cuff. I went for a spread collar with a large tie gap. That tie gap led to a greater arch of the tie than either Burgos or Satriano, though it was also aided by a stiffer interlining. If I were to order again I would reduce this; it was noticeably stiff in the conically shaped cuff. With regards to make, the following things were done by hand: the buttons, the buttonholes and the sleevehead (although you can see from the picture that the latter is coming a little loose already). Less than the other two reviewed shirts, therefore, though it was made well overall. Distinctive aspects of the make are the pleating across the back, which Segun specifically requests and describes as his signature; the red gusset reinforcement; and the red stop-tack by the bottom button. The collar band, though not shown, is wide but narrows conventionally towards the front. Overall, a very good made-to-measure shirt, if a little expensive. I would change the weight of the collar and cuff lining, as well as the cuff style, in another order. And always go for bespoke if it was easy, as it will be now with Satriano. See the introductory piece with links to other shirt reviews here. You can follow the discussion on Segun Adelaja: made-to-measure shirt review by entering your email address in the box below. You will then receive an email every time a new comment is added. These will also contain a link to a page where you can stop the alerts, and remove all of your related data from the site. Great read! any reason for going placket-less with all 3? Is it considered more formal? I enjoy reading your blog. Do you own any shirt made by Charvet in Paris? if you do, could you be kind enough to review it as well. I am looking forward having some bespoke shirts made for me. Also I will like you to review Turnbull & Asser shirt, I am also looking forward to using them. Do you know if Satriano uses sea island cotton for its shirts. Is your preference for fused collars and cuffs? I always feel unfused interlinings are more in keeping with the character of hand made suits, but this line of thinking maybe based more in emotion than reason or simply be a consequence of having grown used to English shirts. I’d be interested to hear your thoughts on this matter. give the guy a chance .. how is he supposed to review every shirt maker there is ..
Those cuffs seem the biggest of all three. How tall are they? Great post. Do you have any experience with Emma Willis shirts ? Very much enjoy your posts — many thanks! I have a question regarding this shirt: it appears that there is a vertical seam in the yoke (last photo). Is this a seam? If so, what is its function? It doesn”t appear to be centered on the yoke — is there another seam to match on the right side? Yes there is a seam. I don’t think it makes much difference whether there is a seam in the yoke or not. I prefer split yokes with the fabric angling downward towards the sleeves. Apart from better pattern matching with sleeves in case of striped or checked shirts, such yokes allow more arm movement in shirts with closer fits because fabrics stretch more diagonally than length or width wise. Try this on a swatch. Two questions; firstly, I understand these are ‘placket-less’. I always thought that that meant that the buttons were hidden completely under an extra layer of fabric, like on some black tie shirts. 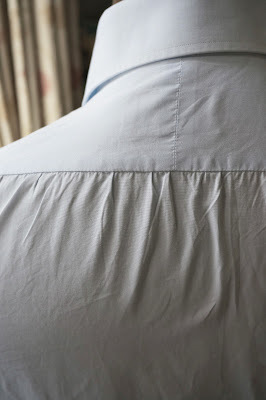 Obviously I was wrong; could you please explain the difference between placketed and placket-less shirts? Also, why do you prefer light fusing for the collar and cuffs? I was always under the impression that a high-end shirt is supposed to have no fusing whatsoever, and that fusing is the marker of a lower-end shirt. 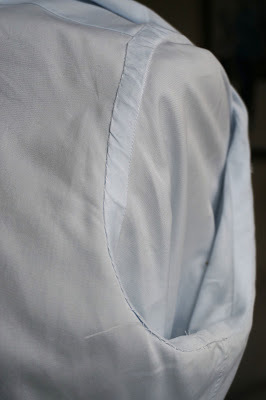 Placket-less means without an extra layer of material for the buttons – the front is just folded back. Yes, the cuffs look out of proportion and the collar too high, unless you have a long neck. I’m not sure the sleeves are long enough. When I raise my arms at elbow level on the sides, my wrist bones are still covered by the cuffs.